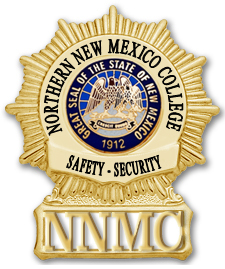 The Northern New Mexico College Safety and Security (505.747.2158) serves both the Española and El Rito campuses and is responsible for all property owned by the College. The Department seeks to maintain adequate staffing to provide proactive patrol, crime prevention, and the ability to provided investigative services. The Department maintains the ability to provide first response level capability to the majority of incidents which may take place within the campus community. Campus Safety and Security Officers are not police officers; they do not have the power of arrest. However, they do have authority of detention when a crime has taken place, and will use this authority when the need arises. The department fully investigates all crimes that take place on College property. These investigations may be conducted independent of, or in cooperation with law enforcement agencies. The Safety and Security Department maintains positive working relationships with area law enforcement agencies. We will cooperate fully with any investigation, through prosecution if possible or required. In addition, Safety and Security staff will fully investigate alleged violations of the Student Code brought to the Departments’ attention or those that Security and Staff member directly observe. Campus Safety and Security staff conducts regular inspections of all interior and exterior building for life safety issues, chemical storage, lights not operating properly, vehicles and pedestrian safety issues. Corrective recommendations in the form of Work Orders will be sent to the Facilities department or other responsible party. Campus Safety and Security Officers are located in the Montoya Administration Building and in the Ben Lujan Library.